How are companies around the world really embracing digital? 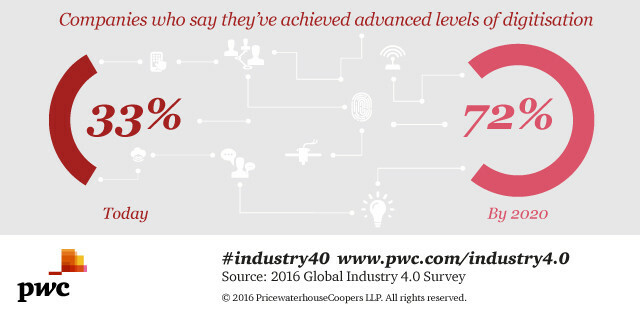 Companies from all sectors across the globe are embracing “Industry 4.0”, or business in the digital age. About one third of 2,000 companies we surveyed in 26 countries already rate their level of digitisation as high, and this value is expected to rise on average from 33% to 72% within the next five years. In South Africa, the current level of digitisation and integration is expected to rise from 27% to 64% within the next five years. Manufacturing companies are digitising essential functions internally, as well as along their supply chains. Some 87% of South African companies surveyed plan to introduce new digital products and data-based services over the next five years. In addition, companies worldwide want to invest about 5% of their revenue annually on digitisation. Based on the industries surveyed, 5% of revenue corresponds to a total investment of $US 907 billion. A major focus of these investments will be on digital technologies like sensors or connectivity devices, and on software and applications like manufacturing execution systems. In addition, companies are investing in training employees and driving requiring organisational change. More than half of these companies: 55% globally, and 74% in South Africa, assume they will amortise this expenditure within the next two years. On average, companies expect to reduce operational costs by 3.6% per year, while increasing efficiency by 4.1% annually. High levels of cost reduction are expected in every industry sector. Most companies believe they will see a return on investment (ROI) within two years or less for their Industry 4.0 projects. Just over a third of companies anticipate a longer timescale of three to five years, but very few think that it will take any longer than five years for Industry 4.0 investments to pay for themselves. Currently, South African companies invest 5.2% in digital operations solutions and expect to invest up to 6.8% over the next five years. A high 83% of South African respondents expect data analytics will have a significant influence on their decision-making processes in five years’ time. Currently, more than half of local companies (55%) are using big data analytics in areas such as optimisation of overall business planning controlling; better manufacturing (48%); and improvement of customer relationship and intelligence along the product life cycle (48%). There are other uses of data analytics that far fewer companies have on their radar screen. These include better service and maintenance of companies’ own assets and products owned by customers. The companies we surveyed understand that it’s critical to have data analytics capabilities in order to successfully drive digital transformation. But there is still a long way to go before these reach the level of sophistication needed to really drive Industry 4.0 applications. Only 10% of local respondents rate the maturity of their data analytics capabilities as advanced, while 66% say that the lack of skills and competencies in their company’s workforce is a key challenge to making full use of data analytics. Some 34% of respondents say their companies rely on the selective ad-hoc data analytics capabilities of individual employees, while another 9% have no significant data analytics at all. In contrast, just under half (48%) of local companies have embedded data analytics into specific functions, giving themselves the flexibility and proximity to business knowledge to fully utilise the potential of data analytics. Another 5% of companies have a dedicated department for data analysis serving many functions across the company. To reach excellence in data analytics, industrial companies will need access to a wide variety of skills, including those of data scientists and algorithm architects.. Lack of internal digital culture and training (58%), and insufficient talent (40%), top the list of the challenges identified by South African respondents. Many industrial companies will need to develop digital skills sets around creative digital strategy design, technology, architecture and design, and user experience design. Without the right digital culture, the best talent will not want to stay. Digital ecosystems and a broad use of data also raise important issues around cybersecurity. Our South African survey respondents raised concerns around cybersecurity breaches (53%); damage to company reputation and loss of trust due to data loss (47%); and liability risks through data loss (40%). Other issues like loss of IP and violation of regulation and laws on data security or data privacy are on the radar too. Although companies worldwide are pressing ahead with Industry 4.0, the study shows regional emphases in their objectives: corporate groups in Japan or Germany are using digitisation above all to increase their efficiency and product quality. In the US, the tendency is emerging to develop new business models with the aid of digital offers and services, and to provide these products and services digitally as quickly as possible. Although Asia Pacific companies report the highest digitisation and integration levels today, it is companies in the Americas followed by those in Europe, Middle East & Africa (EMEA), that expect to have the largest gains in digitisation levels by 2020 (71%). 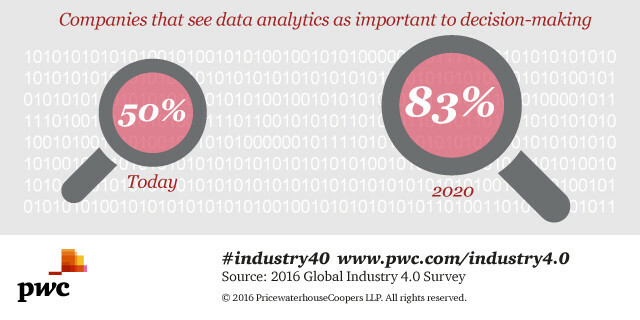 To move forward with Industry 4.0 digital capabilities is important for industrial companies. However, a step-by-step approach is important. This includes planning a strategy, creating initial pilot projects, considering how you can best organize data analytics, and develop complete product and services solutions for customers. Industry 4.0 will be of significant benefit to those companies that fully understand what it means for how they do business. Change of this nature will transcend a company’s boundaries, as well as the national boundaries of the countries where an organisation does business.